I’m sorry in advance for ruining your day. You will have no peace until you make this. I know because that’s what happened to me when I first stumbled upon this recipe. 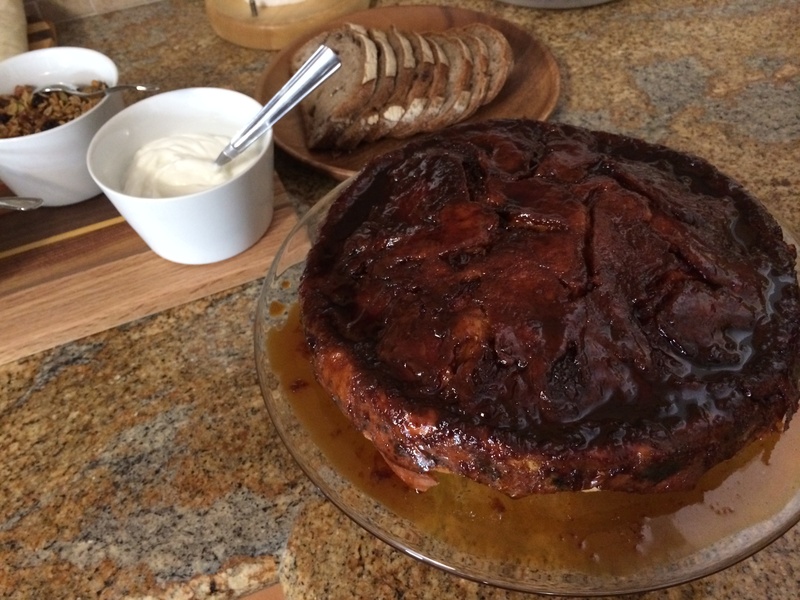 I dreamt of caramel, I had egg custard visions, and I wandered the grocery aisles buying every ingredient I needed to make this bread pudding, because….oooohhh, yes, I was going to make it. No matter that I didn’t have an occasion – I would create one. And that’s how I came to invite our next door neighbors over for a summer brunch, you know, just because! (insert wicked grin) As we tasted our first forkfuls of bread pudding, silence descended over the backyard. And all was well. Now, this may look like dessert, and it probably could be, but in technique and flavor it most resembles an extremely luxurious french toast. And aside from the salted caramel lid, it is not excessively sweet, so makes the perfect finale to a lazy weekend breakfast or brunch spread. Its real beauty comes from the fact that all the effort is made the night before, which allows you to wake up late, and take a nice long bubble bath (or chase your toddler frantically around the house to please put some clothes on, your choice) while this puffs up golden and beautiful in the oven. I will leave you now to figure out when you’re going to make this, because you know you must. As for me, I think it’s been an awfully long time since we saw the nice lady who lives across the street from us. First, choose your baking vessel. 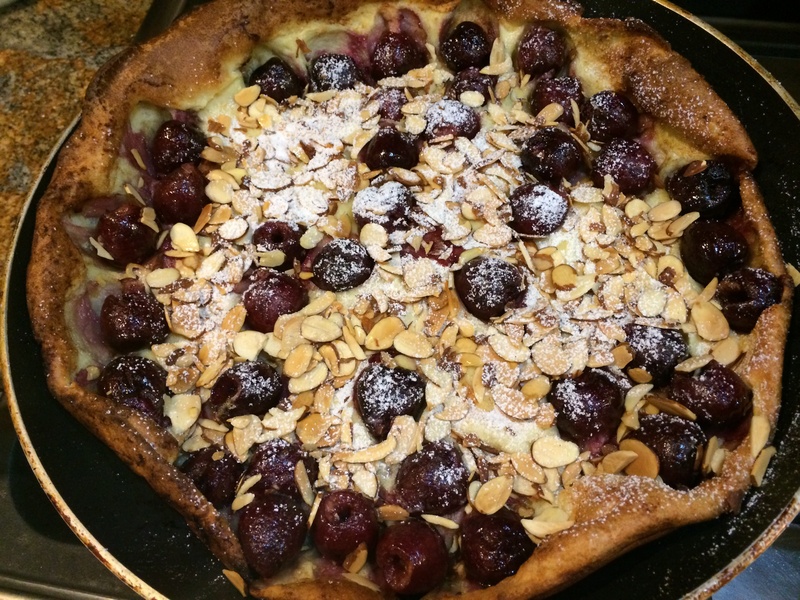 Options include a 10 inch cake pan, 9- to 10-inch cast iron skillet, 2-quart casserole dish or a deep-dish pie pan. If your vessel is safe for the stovetop, use this to make the caramel. If not, use a small, heavy saucepan. In either, place 3/4 cup sugar, butter and sea salt and heat over medium heat. The butter will melt and, after 7 to 10 minutes, the sugar will dissolve and begin to brown. Reduce heat to medium-low and stir with a spoon or spatula so that it browns evenly. You will find that the butter separates from the melting sugar and this is just fine. Do your best to keep them stirred together but know that it will all work out in the end even if it’s split. If you’re using a saucepan, your caramel is done when it reaches a copper color. Pour it into the base of your baking vessel. If you’re making the caramel in your final baking vessel, your caramel should be taken off the stove a step sooner, a shade more pale than copper, something of a medium brown; this is because it will continue cooking and darkening for a minute off the stove. Regardless of baking vessel, place dish in refrigerator and chill until caramel is cold and solid, about 30 minutes. Once chilled, arrange the bread slices. Place the heel of the bread in the center and do what you can to fan the slices around it, overlapping each slightly. In a large bowl whisk together eggs, remaining 2 tablespoons sugar (if using; I skipped this) and 1/4 mascarpone cheese (save rest for serving), until very smooth. Add milk and almond extract. Pour this over the bread, making sure to saturate all of it. Cover tightly with plastic wrap and chill overnight. If you bread seems too high in the vessel to get a good soak, you can weight it with a plate in the fridge. In the morning, take your dish from the fridge an hour before you want to bake it. Heat oven to 375°F. Remove plastic from dish and bake 30 to 35 minutes, until moist but not wet in center. Remove from oven and run a knife around edge of dish, loosening bread from sides. Place a serving plate over top of dish (bottom side up), and, using potholders, hold pudding over sink and flip pudding onto it. Lift baking dish off plate; scrape any extra caramel from pie dish over pudding. Serve, cutting it into wedges at the table and spooning a healthy dollop of mascarpone onto each plate. Now that berry season is here, all bets are off. I know I should be making well-balanced meals and considering nutritional content, but summer makes it hard. 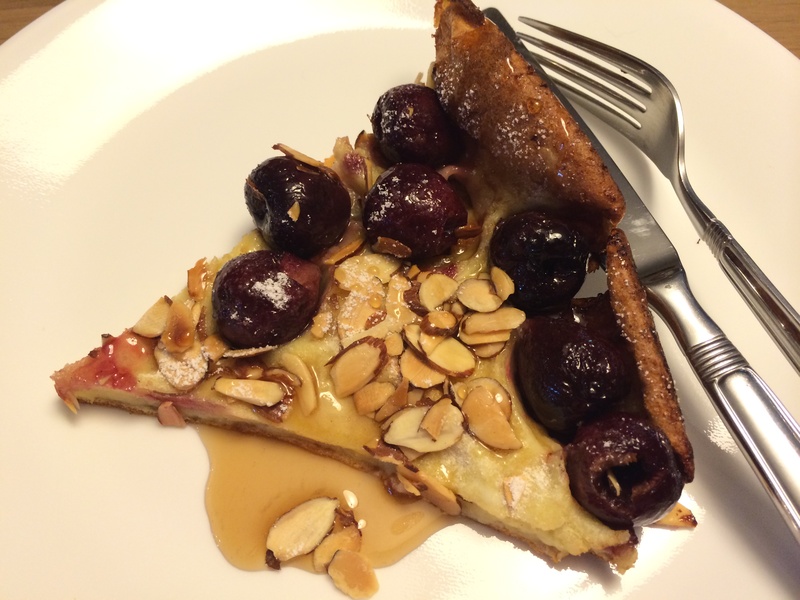 On the one hand, it’s easy to just eat a bowl of cherries and call it lunch. But berries also make for the best baked treats. They do. They’re colorful, juicy, and lend incredible moistness and flavor to anything on the sweet side. So expect to find more than your fair share of berry desserts over the next few months. We will make up for it later. 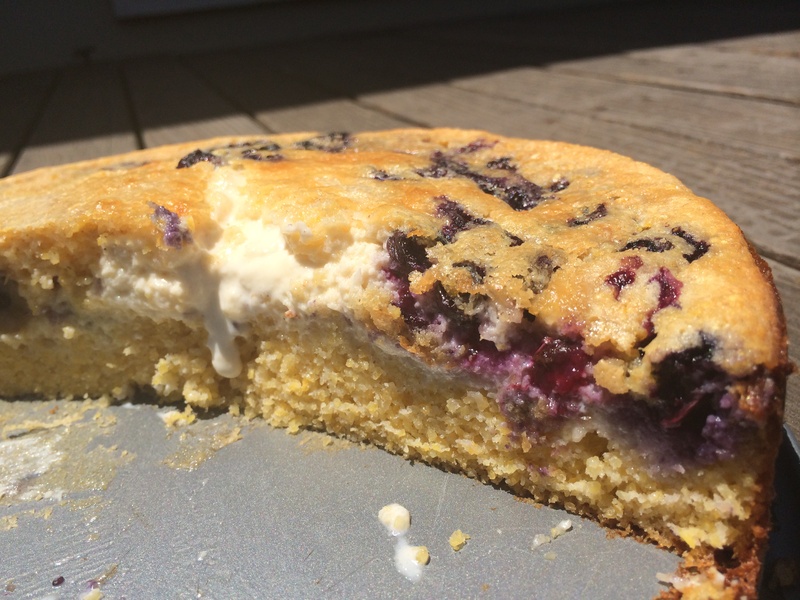 This custard filled cornbread is a prime example. There may be those of you who believe cornbread shouldn’t be messed with since it’s perfect on its own. But I implore you to try this breakfast version. 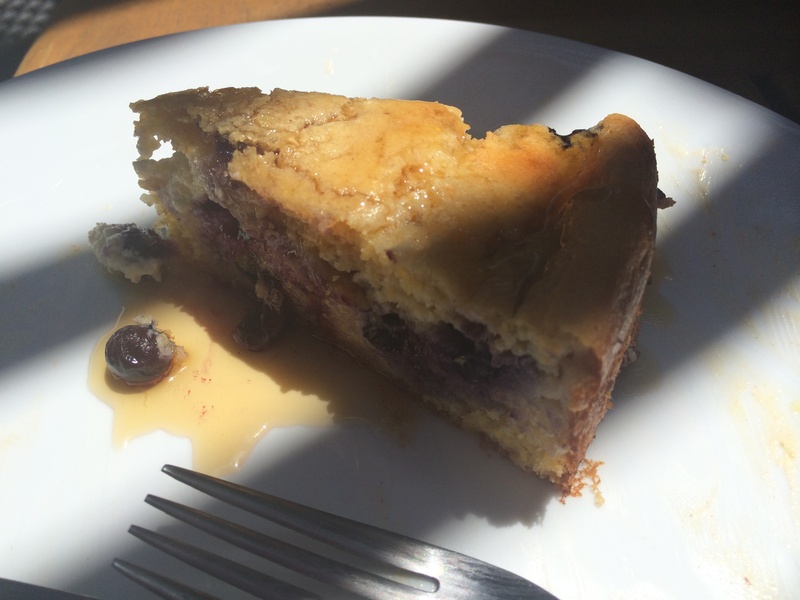 It’s very mildly sweetened (although we like to correct that problem by dousing slices in maple syrup), and the recipe creates a magical custardy filling and blueberry topping that are nothing if not fun in the kitchen. And best of all, it reheats like a dream, and tastes almost as good on day 4 as it did on day 1. Perfect weekend brunch (and possible leftovers) material. Preheat the oven to 350 F. Butter a deep-dish 10-inch pie pan. Place the buttered dish in the oven to warm while you make the batter. In a small dish, melt the butter in the microwave on medium-high heat, careful not to let it splatter (about 45 seconds). Pour into a large bowl and set aside to cool for a few minutes. Meanwhile, in medium bowl, whisk together the flour, cornmeal, baking powder and baking soda. Set aside. Add the eggs to the butter and wish to combine. Add the sugar, salt, milk, buttermilk, vinegar, lemon zest and vanilla and stir well. Whisking constantly, add the flour mixture slowly and stir until the batter is smooth. Remove the heated pan from the oven and set on a baking sheet for easy transport to and from the oven. Spoon the berries into the bottom of the pan in an even layer. Pour the batter on top of the berries. Then ever so slowly, pour the cream right into the center of the batter. Don’t stir. Carefully slide the pan into the oven, taking care not to jostle. 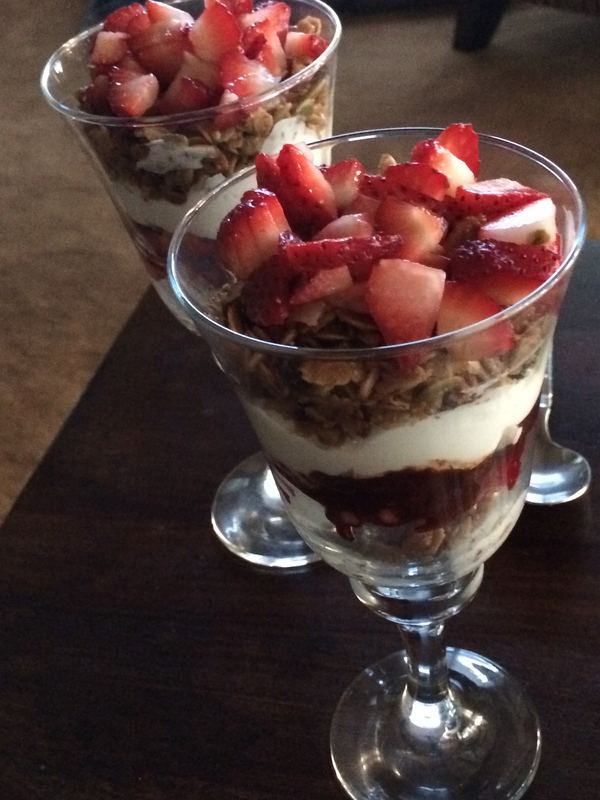 I know the whole granola yogurt parfait is so…oh, so 90’s. But I couldn’t help myself. The layers just looked so pretty in the glass. And really, do I need an excuse to add yogurt to anything? You may pass up on the parfaits if you must, but please, please don’t miss the chance to make this granola! I have eaten almost nothing else all week. This is part of my continuing quest to streamline weekday breakfasts in our household, and it’s a home run. I can see myself happily digging into my little bowl of granola for months to come. With little tweaks for the seasons – maybe swapping out the nuts and dried fruits for others, maybe adding a touch of warm spices to ever-so-slightly change the flavor profile. The base recipe, though, is pretty close to perfect. It uses olive oil instead of butter or other fats. Maple syrup is the primary sweetener instead of honey. And the crunch ratio is exactly right. Best part? It takes about two minutes of your time. 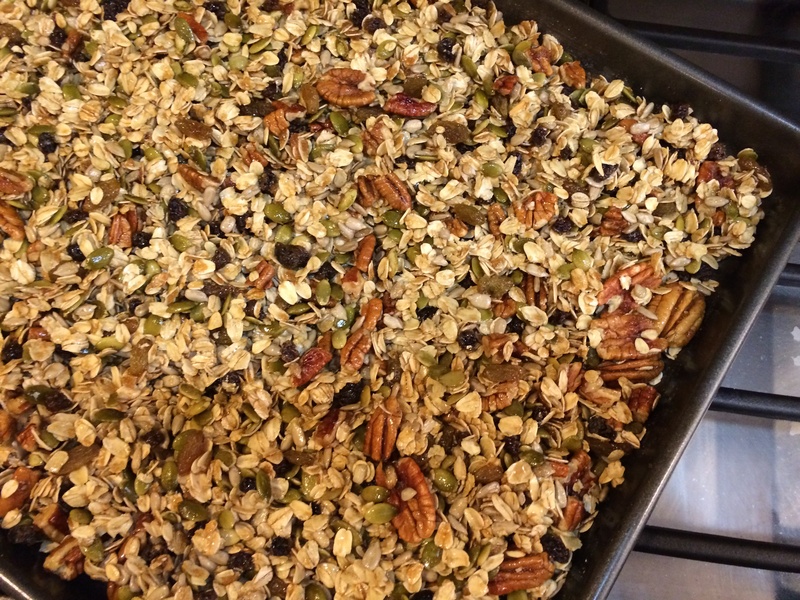 Make granola at home once, and you will wonder how you ever bought a bag of the flavorless stuff from the store. This is my contribution towards bettering your life. There’s no turning back now. Heat oven to 325 degrees. Combine the dry ingredients in a rimmed baking sheet. Add the maple syrup, oil, brown sugar and salt and stir until well incorporated. Bake for 45 minutes until toasted and golden, stirring every 15 minutes so ingredients don’t clump too much. (If you like larger clumps in your granola, stir less often.) Remove from the oven and let cool completely before transferring to an airtight container. 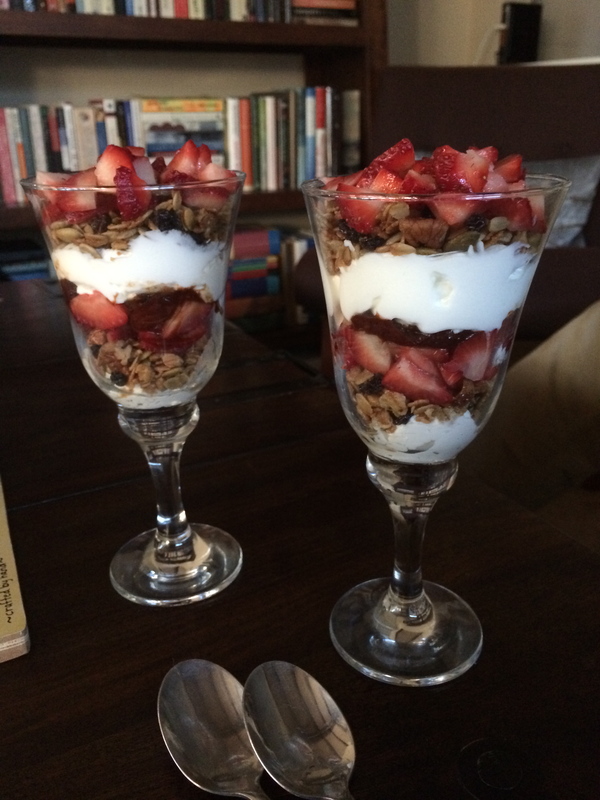 To make parfaits with this granola, layer with thick yogurt (or ricotta! ), and your choice of sliced berries. I used strawberries, and snuck a layer of roasted strawberries (with some balsamic vinegar) in between for an extra dimension.